There are many fine national institutions this sceptred isle has to offer: fish and chips, the perfect pint and Great Yarmouth Pleasure Beach to name but a few. There is one institution, however, that stands proud, shoulder to shoulder with the iconic monuments that make Britain great. One that has bred a generation of imaginative free thinkers. One that symbolises everything that was good back in 'the day'. That one is none other than the mighty 8-bit home computing revolution. These revolutionary creations were the heavyweight champions of 80s gaming, and some of the most cherished items of computing memorabilia to grace the pages of eBay. To relive those bygone days often requires us to install any number of emulators onto our hulking behemoth PCs, which takes away some of the spirit that embodies the golden age of the home computer. There's another option, of course; we could purchase one of our beloved machines from eBay and hook it up to the old 52-inch plasma TV. However, these computers are getting a bit long in the tooth, and unless they've been cherished and looked after there's the possibility they could go zap and pop once plugged in to the wall. There is an alternative, though - one that combines the modern with the not-so-modern. The Raspberry Pi - arguably one of the best innovations since the home computer, and one that is heralding a new golden era of computing. This credit-card-sized computer is seeing its fair share of imaginative doings from the public; being sent to the edges of space, turned into a 40s wireless set, home automation controllers and many other projects that have gone to prove just how versatile and elastic the users, and the RPI, can be. Therefore, we're going to take a leaf from their books, and see what we can do with a few items from eBay, a Raspberry Pi, sticky-backed plastic and help from the growing population of RPi owners, in order to help us re-create a classic 80s retro home computer. The legal bit The legality of emulation is something of a grey area at the best of times, but in essence: if you own the console, and game, then you are allowed to obtain a copy of the corresponding roms to emulate them. At least that's what we think. If you're not sure, it's always best to look it up, just in case. Our first port of call is that lovable rubber-keyboarded gem, popularly known as the Speccy. Indeed, the ZX Spectrum 48k was a powerhouse of innovation back in its day, turning bedroom programmers into commercial software giants overnight, where teenagers could come home from school and tap away until dinner time to create some of the best-loved games in computing history. Anyway, enough nostalgia as it's bringing a tear to the eye. After a brief browse through the pages of eBay, we found a dead ZX Spectrum that came in at the paltry sum of £2.99 - after all it would be sacrilegious to mutilate a living Speccy. It looked a little worse for wear, but then most of us who can recall playing on one of these don't look overly healthy these days either. Our first task was to make sure the RPi was up to spec; we'd been playing around with it since its arrival in the post, and as things move fast in the world of Pi we felt it was time to do an upgrade to Wheezy. 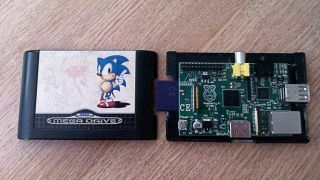 The system download can be found on the Raspberry Pi pages, along with full instructions on how to transfer it to an SD card, and get up and running. After that we did the necessary sudo apt-get update/upgrade, and within minutes our RPi was up to date and running like a charm.